Double Peak Challenge is a celebration of outdoor recreation like no other, where trail runners will experience unparalleled beauty from atop North County’s highest point. 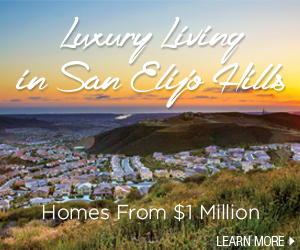 Off-road racers will set out from San Elijo Hills Neighborhood Park and begin their 1,176 foot gain up to Double Peak’s summit at 1,558 feet above sea level, winding along beautiful hillside trails with amazing views. Not up for the full 10K? No worries! Double Peak Challenge also offers a shorter 2-mile course as well as a Trail Tot for kids. Race proceeds will benefit the San Marcos community through two important non-profit organizations: Friends of San Marcos Parks & Recreation and The San Marcos Promise.